The name of Coker, along with names of other iconic founding families of the Sutherland community such as Harshfield, Applegate, and Trego, is synonymous with our history. Sadly, with a few exceptions, these names are infrequently heard these days. From the archives of the Sutherland Centennial, 1891-1991, published in 1991. 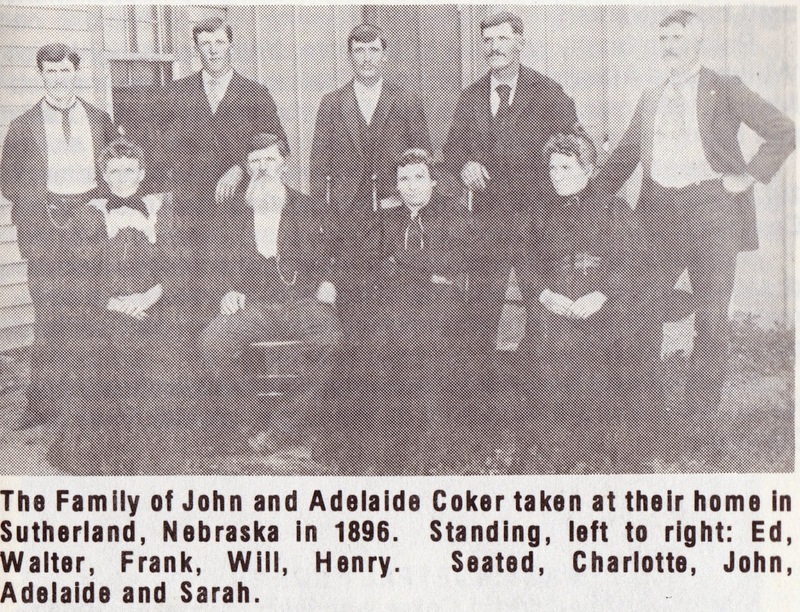 A pioneer family which had a big part in the settlement of the ranch country of Nebraska in the early days, and who have helped to guide the destinies of their own community for many years, are the Cokers of Sutherland. John Coker was a native of Cornwall, England, born October 14, 1829. He came to the United States when he was 21, via Canada and New York State, working for a few years in Pennsylvania, and finally settling in Grant County, Wisconsin, in 1855. Mr. Coker first married Jane (Dinsdale) Chapman. She died suddenly of heart failure, November 24, 1857, aged 37. John’s second wife was Adelaide, the younger daughter of Pierre and Sarah (Hancock) Calame, born February 15, 1840. John and Adelaide were married in March of 1858. About the second year after they were married, they bought a farm at Monfort Junction, near Mineral Point, Wisconsin, and lived there for approximately 27 years. He became a naturalized citizen and fought in the Civl War. John and Adelaide were the parents of nine children: Charlotte (Mrs. Reuben Ellsworth); Sarah (Mrs. James Rowe); William, who married Cecelia M. Fye; Henry who married Alverda Peale; Frank who married Myrtle Coates; Walter who married Eva Lou Peyton; and Edward who married Mary Evaline Yates; a boy, Verner, passed away when he was not quite three, and a daughter born in 1882 who died in infancy. Mr. Coker was not a farmer by trade, but a miner. His name will be handed down to posterity as the man, who with John Jeffrey, discovered and started the famous Coker Mines on a farm in the township of Mifflin, Iowa County, Wisconsin, near Livingston. Mr. Coker influenced Mrs. Coker against her wishes to sell the farm for $20,000.00 with which he bought land, with hopes of mining. Coker and his father-in-law, Pierre Calame, drilled, and in the first drill hole struck the beginning of the great “Black Jack Mine”. That was in 1876. Although a zinc mine, the Coker Mines were virtually a gold mine for its later owners, bringing them millions of dollars. Coker and Jeffrey exhausted their finances, because they were not equipped to fight the water that seeped into the mines. After eight years of vain endeavor, they gave up, losing all their property to this mining speculation in 1883. Structures that housed 45 families of the 400 men employed at the mine were dismantled. Nothing was left of Cokeville after 50 years of production at the mines that ended in 1927. 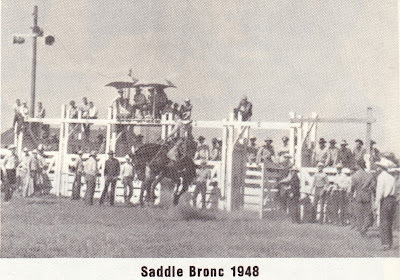 John Coker heard of a man by the name of John Bratt, who had a large cattle ranch in western Nebraska. He corresponded with him, and in 1883, decided to see what this vast new area had to offer, and traveled north of Sutherland. In 1885, he brought his wife and four sons, along with their livestock to the ranch from Monfort, Wisconsin, in an immigrant car on the railroad. The two married daughters did not come to Nebraska; Sarah living in Hebron, Montana, and Charlotte in Beloit, Wisconsin. William, Frank, Walter and Edward accompanied their parents, but Henry stayed behind to salvage what he could from their Zinc mine and drive a mail route. 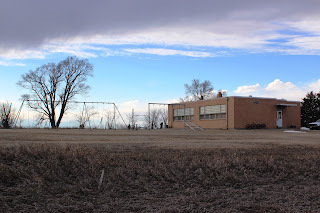 The Coker family first arrived in North Platte, thence to the Birdwood homestead, which was located seven miles north of Dudley Spur (now Sutherland). This was Section 12 of Lincoln County, and the south half of the section was select school land. The family set out at once to build a sod house on the land now known as the W. Stewart Coker Ranch. Mr. Coker and the boys all took up homesteads, a timber claim northeast of the home place, and pre-emptions, acquiring a vast amount of land on the north side of the North Platte River, five miles west of the junction of the Birdwood Creek and the North Platte River. John Coker paid rent on railroad land to owner John Bratt to acquire title to the ranchland. William, Frank, Walter, and Edward were cowboys for Mr. Bratt. Henry later came from Wisconsin to visit the family, fell in love with Alverda Peale of North Platte, married her and never returned to Wisconsin. 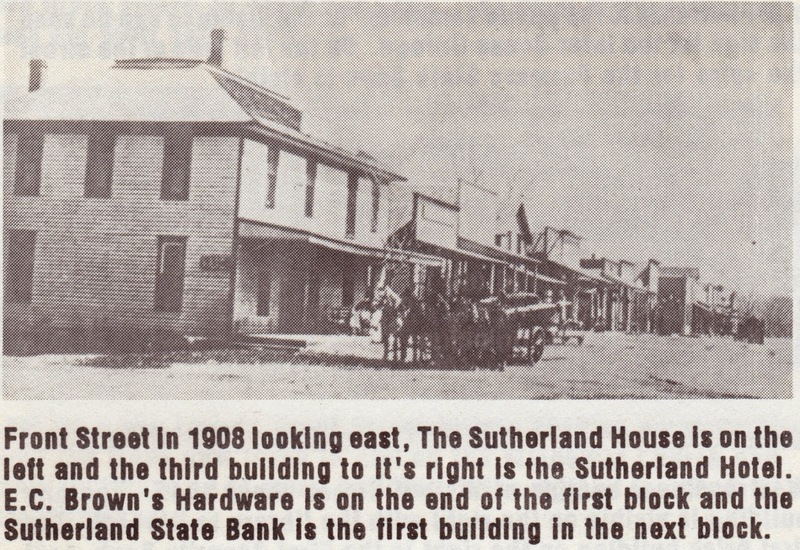 Mr. and Mrs. Coker also owned the Coker House Hotel in Sutherland on Main Street, where many ranch hands lived. I believe either the "Sutherland House" or "Sutherland Hotel" is the Coker House Hotel mentioned. John and Adelaide moved into Sutherland in 1906, living first at 831 Walnut, which was later the home of Walter and Eva L. Coker, at the foot of the hill, then at 620 Pine, later to be the home of Mainard and Edith Coker. John was an invalid for seven years following a stroke. He died September 17, 1914, in the home on Pine Street at the age of 86. Adelaide continued to live there until her death, on April 29, 1920, at the age of 80.